This article is not intended to be a comprehensive discussion of the various forms of frost, but rather how to manage a vineyard following frost damage. In recent years the Breede River valley has been severely afflicted by spring frost in the vineyards. The lower lying areas alongside the Breede River are especially vulnerable. Over the past 21 years severe frost damage occurred in 1997, 2016 and again in 2017. There is a distinction between white and black frost. White frost occurs when the moisture in the atmosphere freezes and small ice crystals form on solid surfaces, such as grapevine leaves and shoots. When black frost occurs, few or no ice crystals form on the crop, because the air is too dry. Ice crystals form inside or between the plant’s cells and frost damage occurs, because the plant’s cell walls rupture. The current drought conditions gave rise to increased frost hazard. Producers differ about the type of frost that occurred this year. In many instances frost occurred in the traditional areas, in other words in the valley and in low-lying vineyards. Physically white ice crystals could be observed, thus indicating white frost. But in many instances there were no ice crystals, consequently it was black frost that occurred. It seems as though a combination of white and black frost caused extensive damage this year. The entire region was on frost alert. With the devastating frost of 5 October, especially, producers had been warned in advance. Methods to thwart frost included amongst others making fires (smoke reduces heat radiation thereby offsetting frost), irrigation of vineyards, spraying of water using mechanical sprayers and flattening of weeds or cover crops in anticipation of the event. 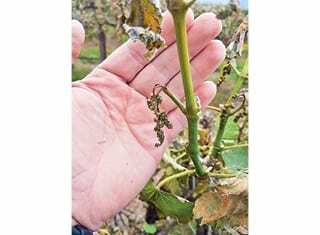 What successfully helped to curb frost damage? 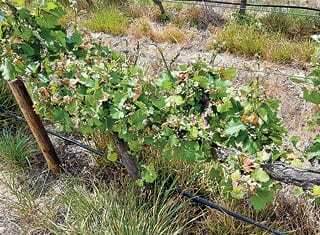 In some vineyards semi-long bearers were left to increase production and also in view of potential frost danger. These semi-long bearers were mostly frost-free and intact and clearly indicated the height of the frost. As a rule the grapevines with higher trellising suffered little to no frost damage. 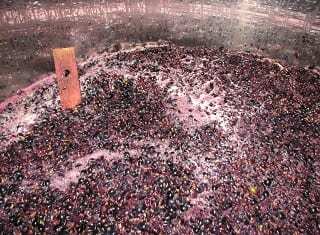 In some instances, however, vineyards boundaries were not sufficiently open for cold air to drain, consequently damage was suffered. On one farm a block of Chenin blanc features both drip and micro irrigation as a result of different soil types. On the morning of the big frost, both were switched on. The section with drip irrigation suffered 100% frost, while the section with micro irrigation had no damage. This can probably be explained by the fact that drops of water have latent energy. It looks as though the mechanical sprayers that squirted water over the young growth were successful, whereas the blowing of air only was less effective. These outcomes were not measured and are based merely on producers’ observation and impressions. There is no consensus yet about the number of rows to be covered per spray. The effectiveness of smoke has also been questioned. It was probably more a case of a producer feeling that at least he did something to try and manage the situation. The correct placement of such fires before the event is also difficult, because a light wind may change direction. The smoke is considered highly environmentally unfriendly. 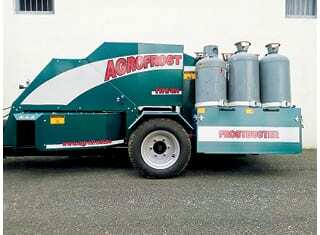 In Rawsonville a producer who regularly suffers frost damage, imported a machine that generates and then emits hot air. It is a very expensive machine, but he suffered very slight frost damage this year. This kind of machine can cover 8 – 10 hectares at most. The results of this trial appear to be cultivar bound. 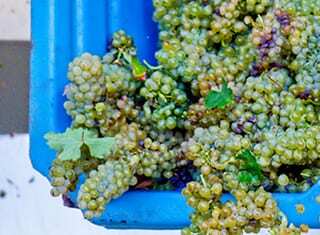 Chenin blanc and Colombar blocks that were subjected to frost this year did not react in the same way at all and preliminary visual observation indicates less grapes. 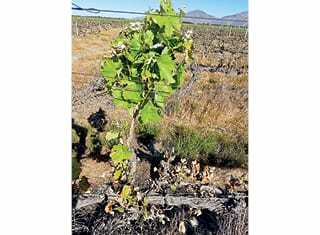 A block of Pinotage in which all canes were broken last year, produced a crop of about 7 t/ha. First determine the extent of the damage in terms of crop losses. For practical purposes the frost damage can be divided into categories of severe (100% crop losses), high (>50% crop losses) and moderate (±25% crop losses). If the damage amounts to less than 50%, the best option is probably to do nothing for the time being. Alternatively all shoots that do not have any flower clusters that were not affected, can be suckered, provided they are not bearers. In parts that suffered severe damage, it is recommended that all shoots be removed, or the green spur be pruned back. A suckering action later in the season is recommended in all vineyards that had suffered frost damage in order to channel the growth to the potential bearer shoots. Automatic weather stations can facilitate forecasting of frost conditions. It is high time for comprehensive research to be conducted in frost areas and an extensive network of weather stations to be established in strategic places. In high frost risk areas, overhead sprinkler irrigation works best to counter frost conditions. Micro irrigation fares much better than drip irrigation. Trellis grapevines higher in the high frost risk areas. Do this by establishing a second cordon higher up. As an alternative consider sawing off and trellising such grapevines higher. 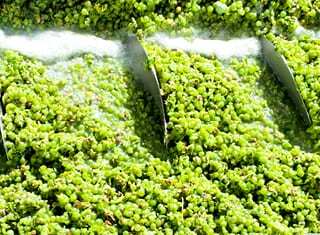 Viticultural practices can be adjusted to minimise the frost damage. Pruning of a semi-long bearer (Cazenave shoot) may be considered. Plenty of (more expensive) options are available, such as the so-called frost blowers and hot air machines. Comprehensive research studies are essential. The possibility of chemicals that can reduce the freezing point of the plant sap must be investigated. Cane with flower clusters that succumbed to frost. Chenin blanc with drip that suffered extensive damage. Cazenave shoot that was not damaged and indicates the height of the frost.